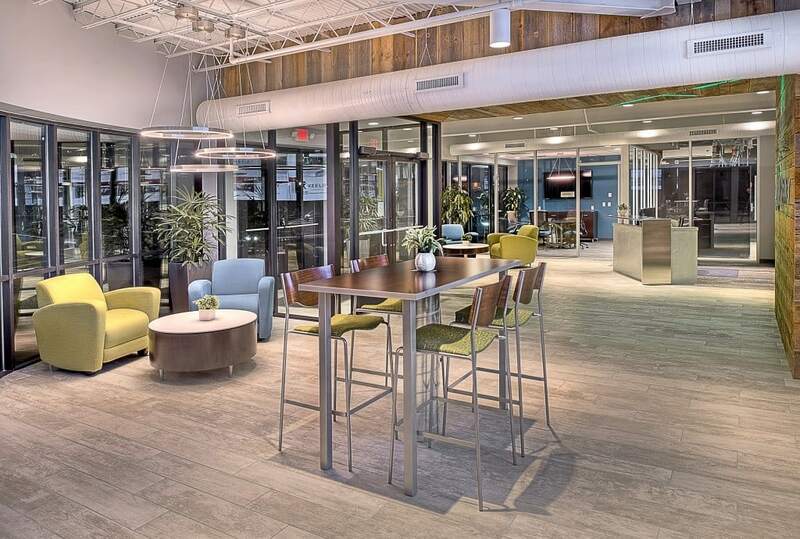 A dream of consolidating all of its employees into one new headquarters became a reality for this corporate construction company. 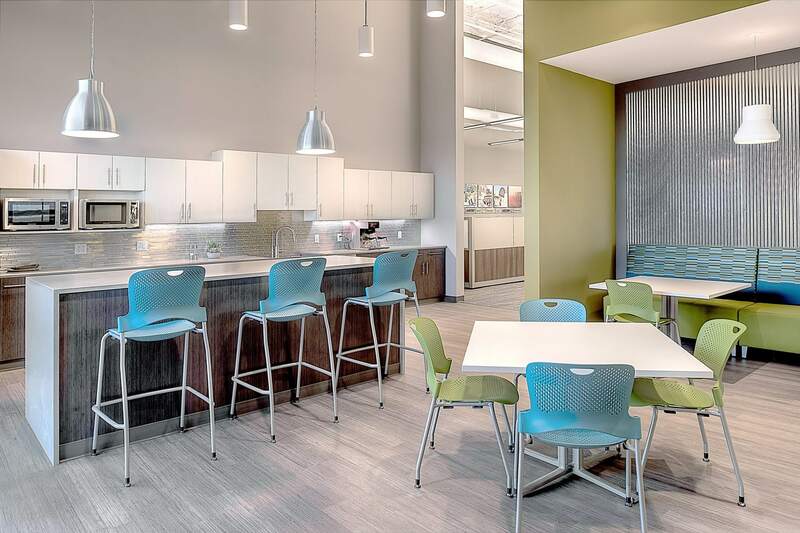 While looking to create a space with high energy to inspire and engage employees, it was important to unify its brand and translate its core values into the workplace environment. The revitalized space features exposed structure and raw building materials of concrete, steel, wood, and corrugated metal, emphasizing the “construction” presence. Layering of the unique materials, along with brand colors, rich textures, and industrial fixtures completes the interior identity. The addition of design elements such as solar tubes, glass partitioning, an interior garage door, as well as converting existing dock doors to large windows, increased the natural daylight, accentuating the interior openness and the stunning midtown views. Neighborhood and departmental requirements and adjacencies dictated the organization of the space. By centralizing the interior offices and shared conference spaces, neighborhoods with distinct identities were formed. Casual break out spaces between neighborhoods encourage collaboration and teamwork. Energetic gathering spaces are included on each floor to provide a social retreat and capture the spirit of the interiors. 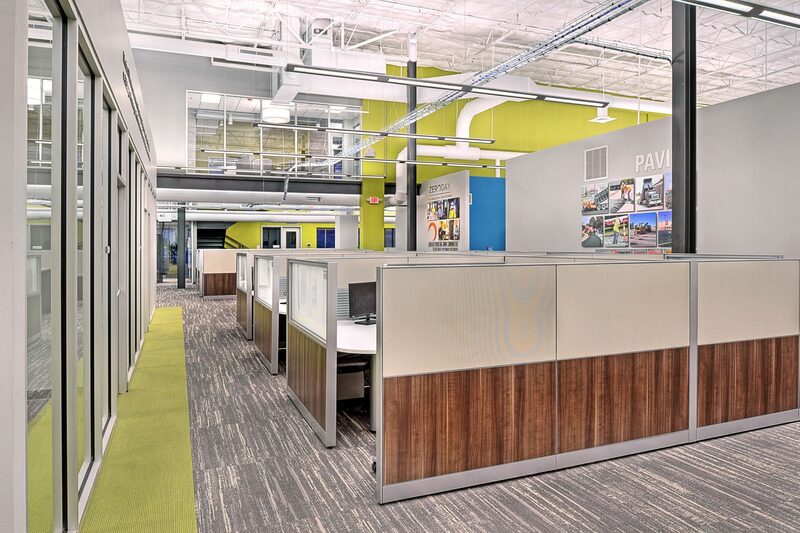 Finally, large scale collage-style graphics feature the company’s Building Groups, the company culture, as well as community involvement, and corporate history. These graphics and use of materials throughout the space act not only as a wayfinding strategy, but a showcase of the foundation and values of the company.